The richest are getting richer and the poorest are getting poorer. Everybody knows about this and many things that this is a flaw in the modern economy, but surprise… this is not something new at all. Things have been so for many many years and this is not going to stop anytime soon. Contrariwise, the inequality has been getting progressively stronger. According to a recent research made by two guys named Emmanuel Saez and Gabriel Zucman, not even the top 1% by wealth acquire the most of the income in The United States, it’s the top 0.01 percent of the people who have been getting really wealthy. In 1960, the top 0.01% had around 3% of the wealth in America. Today they possess nearly 12%. And as you can see in the following chart, their curve is pointing steeply upwards. 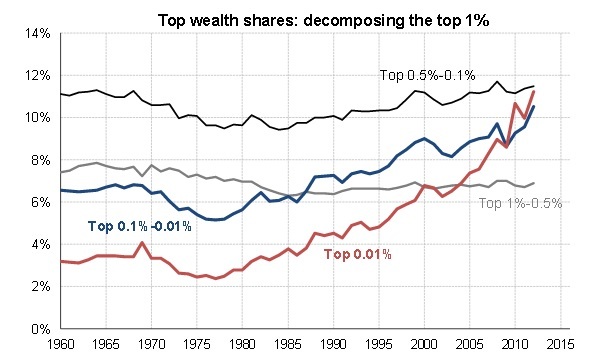 Wealth Inequality changes in the United States in the top 1% by wealth. You can see an interesting infographic about the world wealth distribution and see how wealth is distributed around the globe. Please share this material is you find it interesting.